City-based photographer Pooja Chordia gears up for her first public exhibition at Art Houz on March 2. She shares some of her favourite prints with CE. CHENNAI: A couple of years ago, a young commerce graduate from Stella Maris headed to Paris to pursue her longstanding passion to wield the camera. There has been no turning back since. The 27-year-old’s love for all things natural began from her days at The School KFI. “Nurturing our surroundings, appreciating natural bounty — these were ideals that were engrained in our daily lessons. Many of my classmates have ultimately gone on to pursue careers that involve giving back to Earth. It’s heart-warming, in hindsight,” she opines. The spotlight of the three-day exhibition will be photos from her travels through the African subcontinent last year, covering a range of animals from big cats to tuskers and everything big and small in between, with renowned Sharad Haksar in attendance as the guest of honour. “The sun sets quite early there. When we were returning to our camps, we spotted a leopard; we suspected it was returning fresh from a kill. Ours was an open jeep and it was dark by then and we were patiently waiting with our camera and infrared lights. We were nervous but we wanted a shot of the leopard, and we got it!” grins Pooja. This image, with the striking eyes of the big cat in focus, would go on to become one of the prints she cherishes the most from her collection. She is however quick to share the tale behind another print, a charging elephant calf. “Tuskers are gentle but they are massive. No one in their right minds would mess with them. We had an encounter once when a herd, which also had adults and calves, crossed our path. We waited — quietly and patiently; we didn’t want to agitate them. Every single one passed, except this one last baby who came and charged at our vehicle. It was easily the most adorable thing we saw and we have a picture of that too,” she smiles. 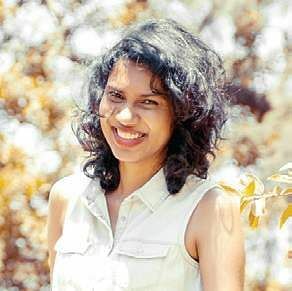 Incidentally, Pooja headed to the African landscapes to aid Wildlife ACT, a voluntary organisation that works with wildlife tracking and conservation. “The idea of making these prints public is to urge people to acknowledge our surroundings. We need to wake up to the need of the larger community out there,” adds the photographer. Flipping through some of the pictures she has chosen for her show, we see a largely monochrome and warm-tinted colour palette. The 33 photographs here will be canvas-framed and available for sale from Rs 3,500 onwards. Pooja’s tryst with Africa doesn’t seem likely to end anytime soon as she plans to head back there in April this year. Besides her landscape and fashion photography work, she is also working on a project to document heritage structures in the city for Ashvita. “I love anything with a story behind it and history has always been a favourite. This is my city and discovering its story layer by layer is something I am really excited about,” she smiles.